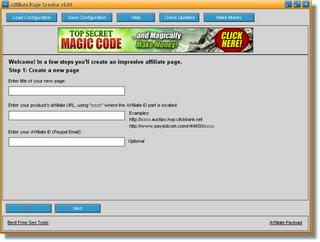 UDM Downloads > Free Affiliate Page Creator Software! Affiliate promotion page creator is a simple windows desktop application that will direct you through the procedures of producing a professional affiliate promotional material tools page step-by-step for your affiliates. By providing your affiliates with ready-to-use affiliate promotional materials with their affiliate links already integrated, you will be able to immediately increase the number of affiliates advertising your products online. That will certainly drive your sales upwards!